My product already has packaging - how do I add a bar code to it? You have two choices: print barcode labels yourself from your laser printer, or have the labels printed by a commercial print shop. Doing it yourself is easy and inexpensive when you only need a small number of barcode labels (or when time is short). If you have a large volume of labels to be printed, a commercial printer may be your best bet. If a commercial printer is printing the labels for you, all you need to do is provide them with camera-ready artwork. Make one copy of the barcode/s you need on labels, and they can print on adhesive stock. Avery and other manufacturers make adhesive labels that can be used in laser printers. You can print adhesive labels that include UPC barcodes and then attach those labels to items that don't have a barcode already on them, or over existing labels. We recommend using laser printers rather than inkjet because the resolution is better, ink spread is a non-issue, and the bar codes scan more reliably. It's sometimes easier to print on an 8-1/2" x 11" adhesive sheet and then cut individual labels out of the full sheet. The 8-1/2" x 11" Avery labels are: #5165, #5265, #6575, and others. Click on the product numbers to buy them from Amazon.com. The labels designed for mailing labels never seem to be the right size. This Word template prints UPC barcodes on adhesive labels in your laser printer. There is a 'readme' document that explains how to use the template. 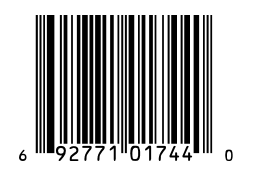 Create UPC barcodes in the UPCTools utility. Copy and paste the barcode into the Word template. It illustrates how to print UPC bar codes on one sheet of paper or adhesive label. Use this document as a starting point for your own projects, including things like doing a mail merge into Word from Microsoft Excel, Microsoft Access, or other applications. When using label stock in your laser printer always use manual feed, and if possible, open the back of the printer so that the page travels through the printer in a straight path. Try using the UPCTallThin or UPCHalfThin fonts. They are pre-narrowed .002" and will produce better results in a laser printer.